James has hypochondroplasia, a form of dwarfism. We performed a lengthening and then nailing (LATN) technique of both lower legs. 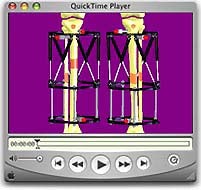 Osteotomies of both tibiae and fibulae were performed and frames were applied. Distraction daily resulted in 2.5 inches (6cm) of increased height over 3 months. The frames were then removed and intramedullary nails were inserted to support the new bone growth as the healing progressed. ...and with the bones fully healed.